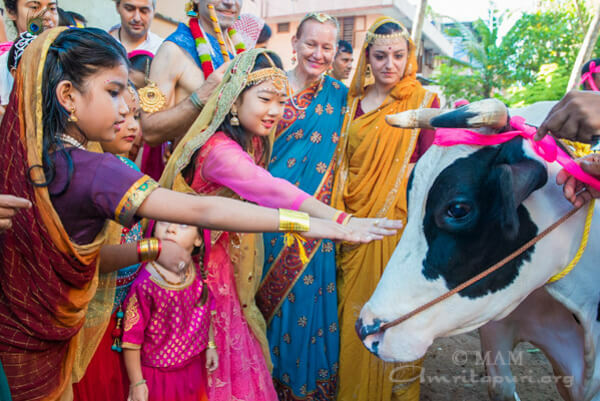 The day’s festivities began with the Go Puja, the traditional cow worship. 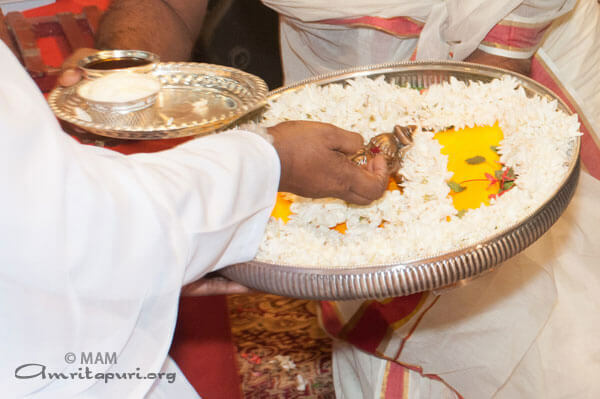 This ceremony is done on this day because Sri Krishna was a cowherd in his youth. 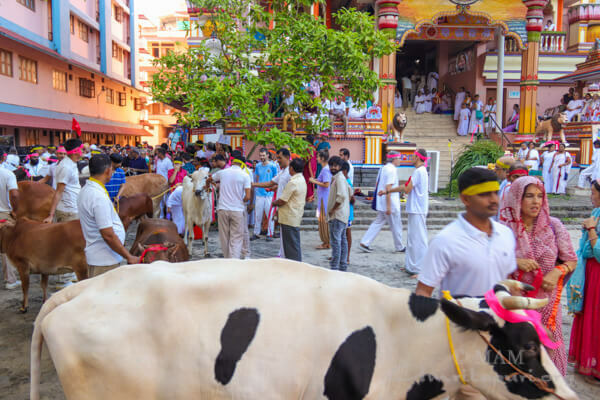 At the head of a procession, the Ashram cows made their way to the front of the ashram where the special puja was performed. 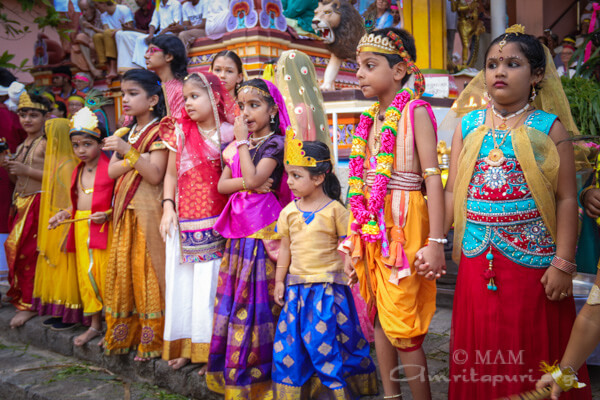 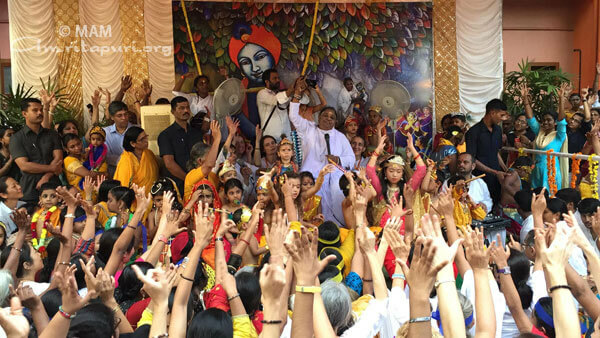 The afternoon saw the Shobayatra – a lively and beautiful procession including many dressed as Sri Krishna, Radha, as well as gopis and gopas – the procession included participants from all over the world. 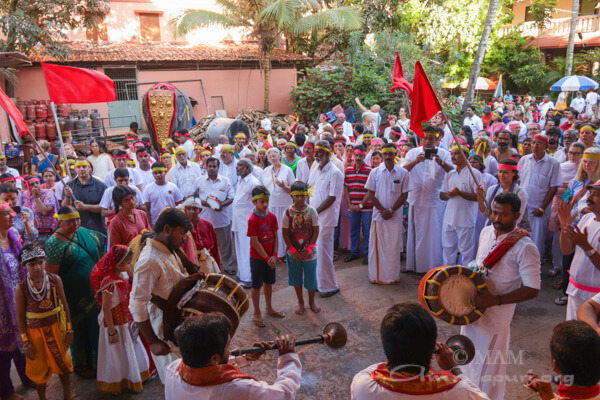 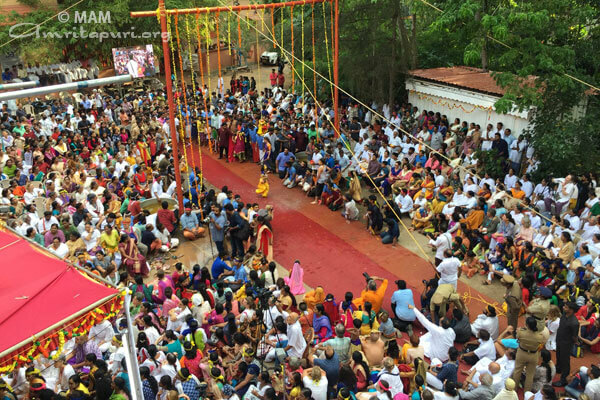 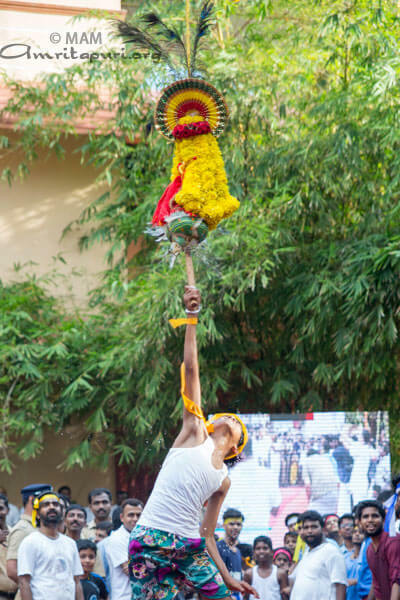 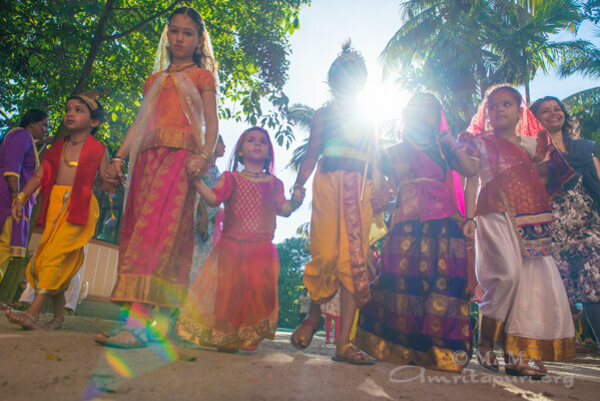 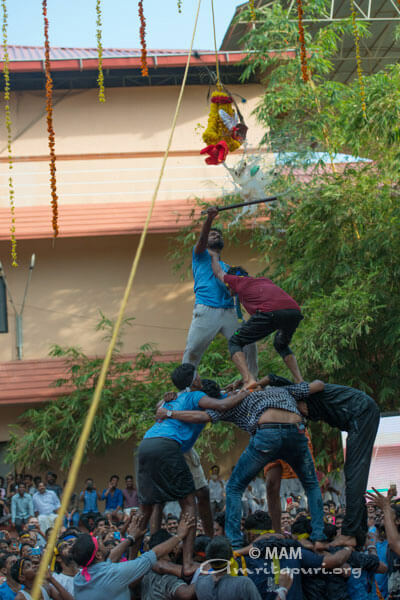 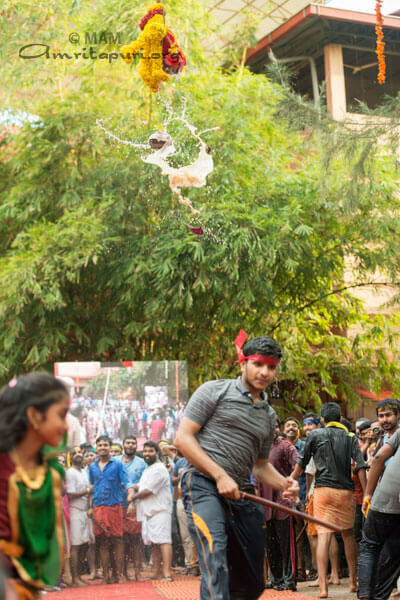 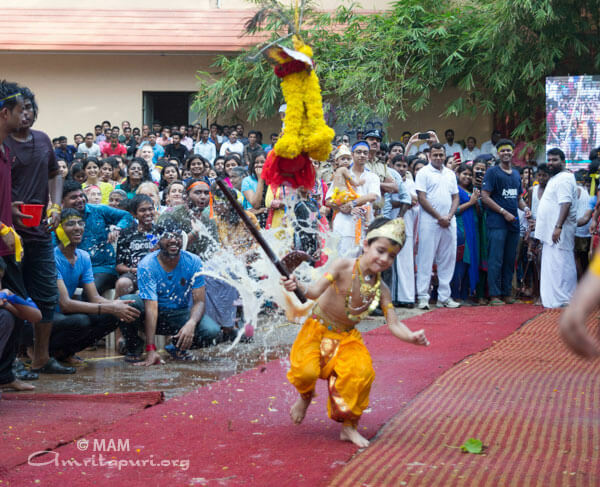 When the procession reached the Ashram, it congregated around the Uriyadi games, wherein children attempt to break a pot which is suspended in the air, expertly pulled just out of reach until a particularly nimble child is able to break it. 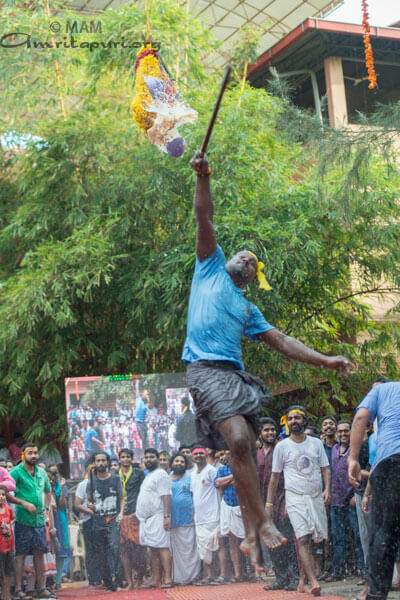 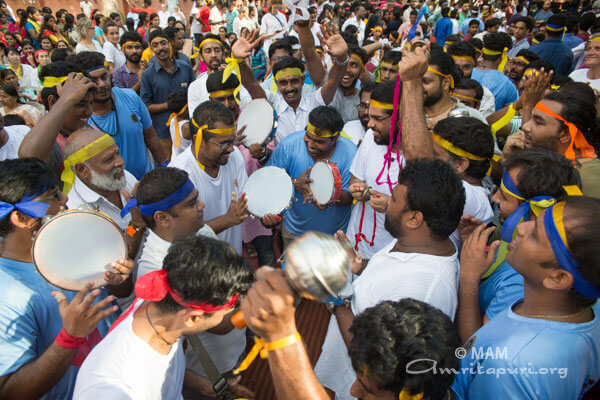 This game was played by Sri Krishna in his youth, and is replayed every year at Amritapuri to the joy and delight of all. 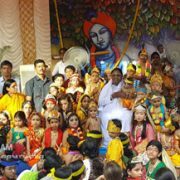 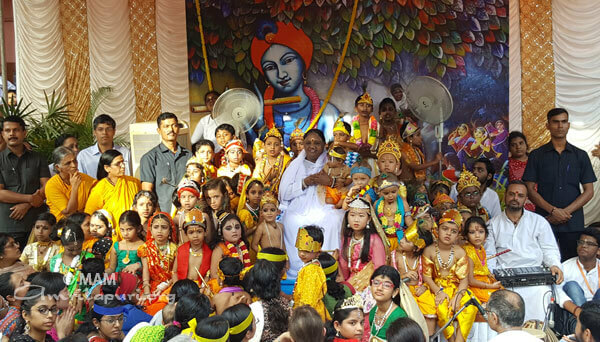 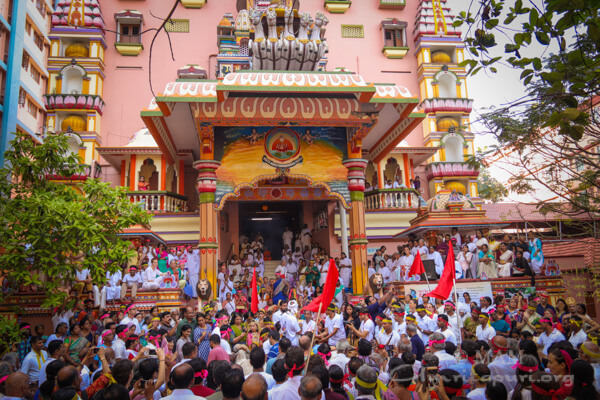 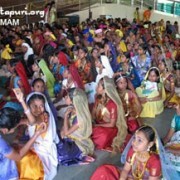 Amma joined in the festivities, observing the Uriyadi games, surrounded by countless little Krishnas and Radhas, including some very little ones who sat on Amma’s lap. 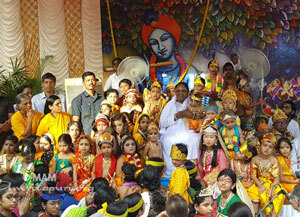 During the games, a recording of Swami Avadhutendra singing Hare Rama, Hare Krishna was played. 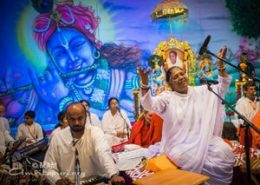 At the close of uriyadi, Amma sang ‘Radhe Govinda, Gopi Gopala; Chitta chorana Krishna; and Krishna Krishna Radha krishna..’ All were singing and swaying in time with the lilting bhajan. 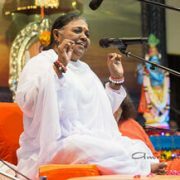 Later, Amma sang many songs to Sri Krishna during the evening bhajans. 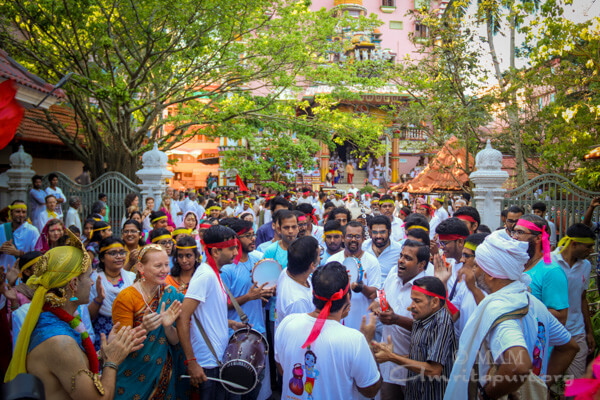 Then, after the traditional reading of the Srimad Bhagavatam, as the clock struck midnight, amidst arati and the reverberations of gongs and drums, the moment of Sri Krishna’s birth was commemorated, and it was as if he was being born again in that very moment in the hearts of the assembled devotees. 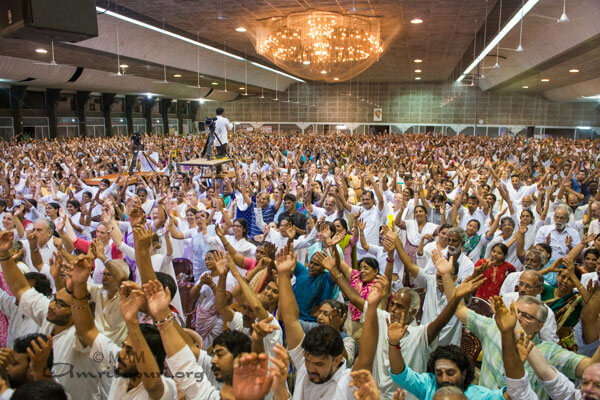 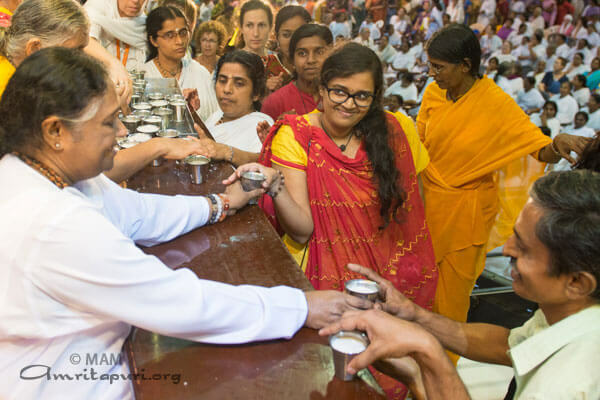 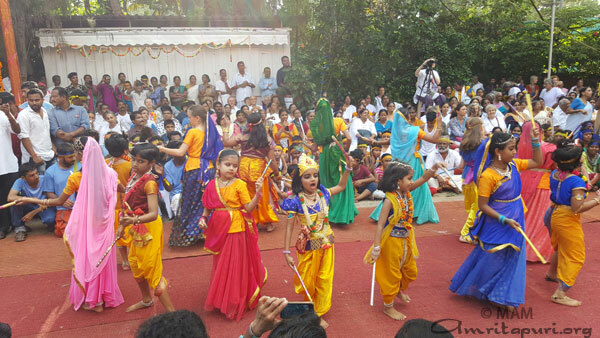 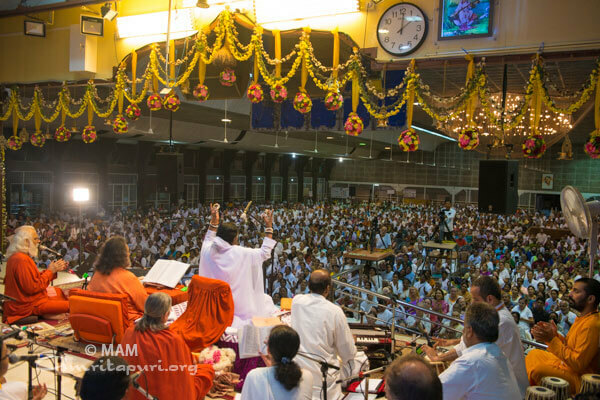 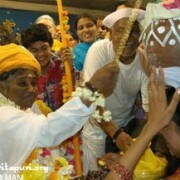 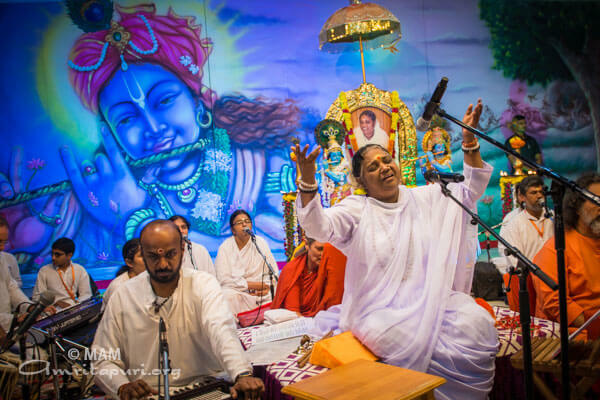 After her message, Amma sang, ‘Madhava gopala mana mohana gopala,’ and danced along with the devotees. 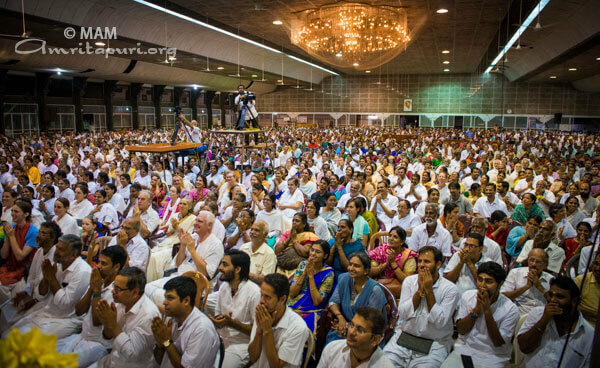 Finally, Amma led all in a for a prayer for world peace and distributed prasad. 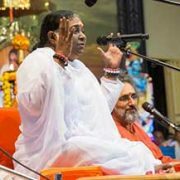 All went to bed with minds full of Sri Krishna, and with hearts full of gratitude for the blessing of being able to live in Amma’s presence, every moment of their lives drenched in love, just as the gopis and gopas lived with Sri Krishna.